holds a radio communication license. process to assure each song meets or exceeds the artist's vision. without wasting your time and money. see why we continue to be one Nashville's favorite recording studios. you know how amazing of a producer you are. Studios in the near future. John again in the very near future. BRIO - Our string quintet recorded a CD with Mr. Magliano recently. Audion. We hope to be back in the studio again soon! recommend the studio to anyone looking for a place to record. unique and powerful sound and for making the process so fun! captures our sound and has great insight and positive feedback. out of nearly a dozen studios over 20+ years. John is a WIZARD. back and recording more songs with you. everyone else in Counter Balance! anybody is looking for a studio, I'm sending them your way. to do it again! Thanks, John! input. We'll be back The Pocket Monsterz. and have a great studio. Broken Bridge will always be grateful. 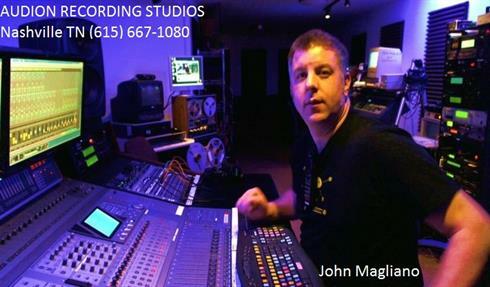 FRED KIMMEL - Audion Recording Studios are AMAZING! John Magliano - You are Genius!! ROBERT CRAWFORD - Track sounds great! You're an absolute pleasure to work with. Stop by and listen to 'What's It Matter'. We proudly recomend these brands.